Mr. John Mielnik, a resident of Honesdale, PA, USA. Mr. Austin Globe (1879-1949), late of Canada. Mr. Dale Imbleau, a resident of Portland, Oregon, USA. Crest: Issuing from a Torse Argent and Azure a Griffin brandishing in the upraised dexter foreclaw a Sword bend-sinister wise and in the sinister foreclaw a Masonic Trowel bendwise all proper. Mr. Erik Rogers a resident of North Bay, Ontario, Canada. Arms: Per Chevron ployé enhanced Or and Sable in chief two Stags trippant respectant and in base a chained Portullis all counterchanged. Mr. P. A. Jubitz a resident of Mt. Hood, Oregon, USA. The armorial bearings of the unmarried daughters of Mr Wade MacTaggart and Mrs. Chong Min MacTaggart (see completed DARs for 2010). Prof. James O’Higgins Norman, a resident of Dublin, Ireland. Arms: Argent goutty des l'armes on a Fess Azure three Towers Argent masoned Sable on a Canton Gules the Coronet of a Spanish Marquis proper. Crest: From a Torse Argent and Azure and issuing from a Tower Sable ported and windowed a demi-Griffin rampant Argent armed and langued Gules brandishing in the dexter claw a Sword bend-sinister wise proper. Motto: Pro Deus Quod Clementia (O God who is Merciful). Mrs. LeeAnn Quiroz, a resident of Gresham, OR, USA. Mr. David Kühn a resident of Bedford, Beds., England. Brian Hannold, a resident of Rochester, NY, USA. Arms: Azure on the crown of a fouled anchor Or a compass rose of the field, on a chief invected Argent a maple leaf between two oak leaves Vert. Crest: On the chest of a bald eagle (Haliaeetus leucocephalus) wings displayed proper a fleur-de-lis Or. Chris Green wrote: Mr. John Mielnik, a resident of Honesdale, PA, USA. Isn't this an infringement on the arms of Sir Robert de Wylebi (Wilbey), found in the Roll of Arms of the Reign of Edward II, "de goules a un fer de molin de argent"? Also, according to Parker, a family named Ferre, "gules a fer de moline argent." I can understand your concern. An heraldic authority might consider that a Fer-de-Moline Argent square pierced Gules was sufficiently different from one without the square piercing, given that the traditional cadency marks are considered adequate difference although equally small. But then that might beg the question: might not Gules a Fer-de-Moline Argent square pierced Gules be mistaken for an early form of differencing of Gules a fer de moline argent? That said, the incidence of identical or virtually identical arms granted in different heraldic jurisdictions during the last 700 or so years is legion. Was Mr Mielnik claiming a family link to the Wilbeys or Ferres (one of whom incidentally infringed the others arms)? On the balance of probabilities, highly doubtful. If he follows this Forum he could enlighten us. At a guess, his name would suggest origins far far away from the authority of an English herald. Perhaps the IAAH herald concerned, our former President Geoff Kingman-Sugars, could comment. I can understand your concern. An heraldic authority might consider that a Fer-de-Moline Argent square pierced Gules was sufficiently different from one without the square piercing, given that the traditional cadency marks are considered adequate difference although equally small. But then that might beg the question: might not Gules a Fer-de-Moline Argent square pierced Gules be mistaken for an early form of differencing of Gules a fer de moline argent? To say that blazoning the fer-de-moline as quarter-pierced creates a difference is like saying that blazoning a rustre as "round pierced" makes it different from other rustres. That said, the incidence of identical or virtually identical arms granted in different heraldic jurisdictions during the last 700 or so years is legion. Does any of this matter? Perhaps it depends on organizational philosophy. I would be the first to agree that duplication of previous arms cannot be prevented 100%, but we all know that very simple arms are likely to have been used before. My view has always been that someone adopting new arms, or designing arms for someone else, should make a good faith effort to avoid such duplication of existing arms as best he can, and that, for an unofficial herald, diversity of jurisdictions in itself is not an excuse. In other words, Lord Lyon can matriculate to the chief of Clan Arthur a coat of arms that to all appearances is the same as that of the Irish province of Munster and would fall within the range of acceptable emblazonments of the small arms of the king of Sweden, and justify it on the basis of ancient use and diversity of jurisdictions. While I, by contrast, would not be justified in suggesting to someone of Spanish descent in New Mexico that he could legitimately bear "Azure three crowns Or" on the theory that Scottish, Irish, and Swedish arms fall into a different jurisdiction. But perhaps the IAAH takes a different approach. Your view and that of the IAAH are identical. I cannot, I'm afraid, speak for the argumentation behind the Mielnik blazon, which occurred "BC" as my wife puts it (before Chris). We must see what Geoff K-S has to say. 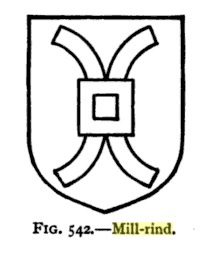 Personally I would not regard the Mielnik arms as an infringement of the Wilbey arms simply because Mielnik is not an English surname, and John Mielnik is a US resident (presumably a citizen). However I am much more concerned about the appearance of the lion of England in the arms of David Kühn, since he is resident in England. I am sure that if he attempted to have these arms granted by the College of Arms, they would be thrown out. The single lion is not part of the royal arms (since the shield of England bears three of them), but for centuries a red chief bearing a single lion has been granted as an augmentation of honour to individuals and corporates, so it would seem as if Mr Kühn has assumed the right to a sign of royal favour. Irrespective of this fact, the Lion resides on the upper part of a 'per Fess' partition and is not to be confused with anything on a Chief. You have to be careful when reading a blazon. First, in a modern world of jet airplanes, widespread movement of people, and the internet, criteria based on national borders is out of date. Second, even if the old jurisdictional approach is still adequate in Europe (which I don't believe), the US is a nation of immigrants, from everywhere else on Earth. Duplicating old arms from a different Old World country of origin risks infringing on the inherited arms of other Americans with a prior claim. And given our history, infringing on existing English arms is even more likely than most to infringe on the arms of another American family with English armorial roots.